Pickling is an ancient art of preserving seasonal produce. All over the world fruits and vegetables are preserved in oil or brine to enjoy in lean seasons. But for us Indians its much more than that. Pickle for us is that inevitable part of our meal without which our taste buds are not satiated. A breakfast of hot alu paratha on some chilly winter morning is unimaginable without a spoonful of chili pickle on top. 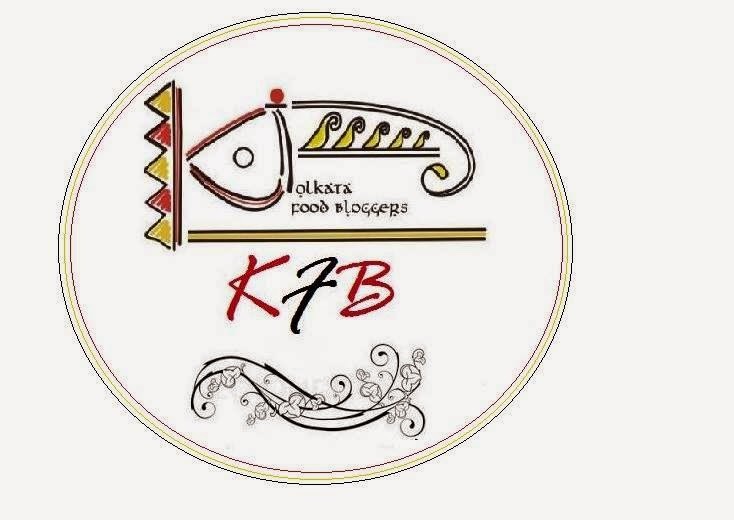 Or take our very own humble khichuri. It does not taste the same without some sweet n sour mango pickle at the sides. And to satisfy that cravings we have a long list of varieties of pickles. 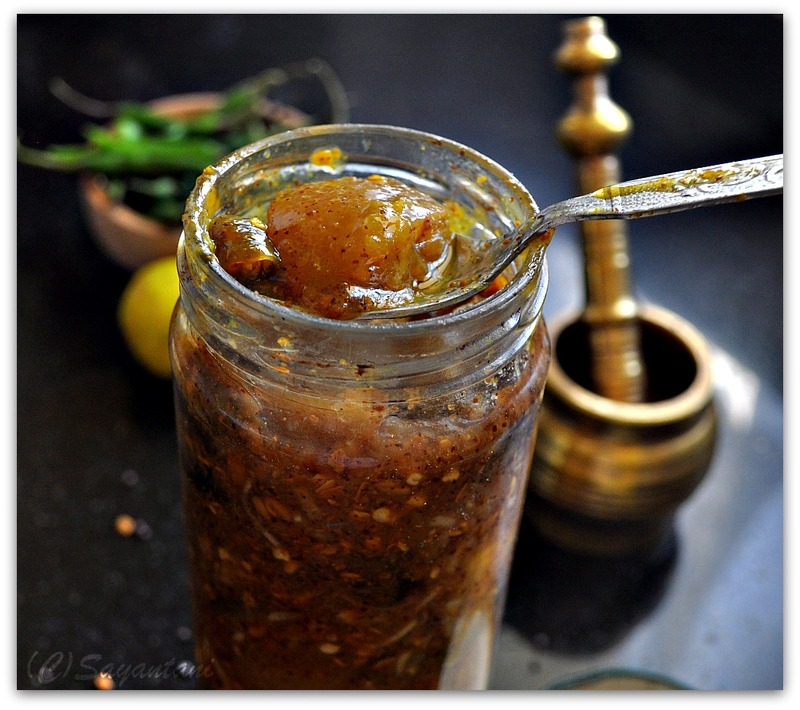 In India pickle making is a tradition, which is shared by almost all households. Our mothers and grandmothers have always taken out time in every summer and winter to make those special pickles using the secret family recipes. They will order mangoes in summer and many an afternoons will be spent peeling and cutting and drying them under hot sun. In winter aunts and elder sisters from the neighbourhood will also join in the pickle making process while enjoying the late afternoon sun. They will talk for hours while picking through the tomatoes, chilies or limes with careful eyes. The vegetables would then be cut and mixed with spices. Pungent mustard oils would be poured and the cooking of all the spices with the oil will create a heady aroma, which will stay there for some days bearing the memory. In our ancestral home we used to have a huge room called Bhandar ghar or food storing room. The room had huge ceramic and earthen pots and most of them were filled with various types of pickles and murabbas. I can still remember those early afternoons when men of the house went to work and unlike other such normal days the kitchen still buzzed with activities. It was a long time consuming process of measuring, dry roasting, grinding, mixing and cooking the spices. but everyone seemed to enjoy that over some chitchatting, leg pulling and gossips. Even they did not mind the month long process of bringing the jars outside every morning to cook it. Later the finished pickles were poured in huge jars with utmost care and stored in the pantry. Every time someone left home for hostel or for work small batches were taken out to pack for them. To make their bland hostel food bearable and also to remind them the love and warmth of home. My mother still do the same every summer and winter. Though not such big batches that my grandmother used to make but still pretty much a decent quantity to feed her three kids and their families. The two little ones in the family have already picked their favourite and never stay away from ordering Didu to send some more when their jars are empty. Lately I also have started learning and making these pickles and preserves sharing them among family members. I love this process where so much of my family tradition is attached. Every time I refill my elder brother’s stock of Gur aam, his eyes light up. This makes me proud and makes me believe that am walking on the footsteps that have a long history of tradition. 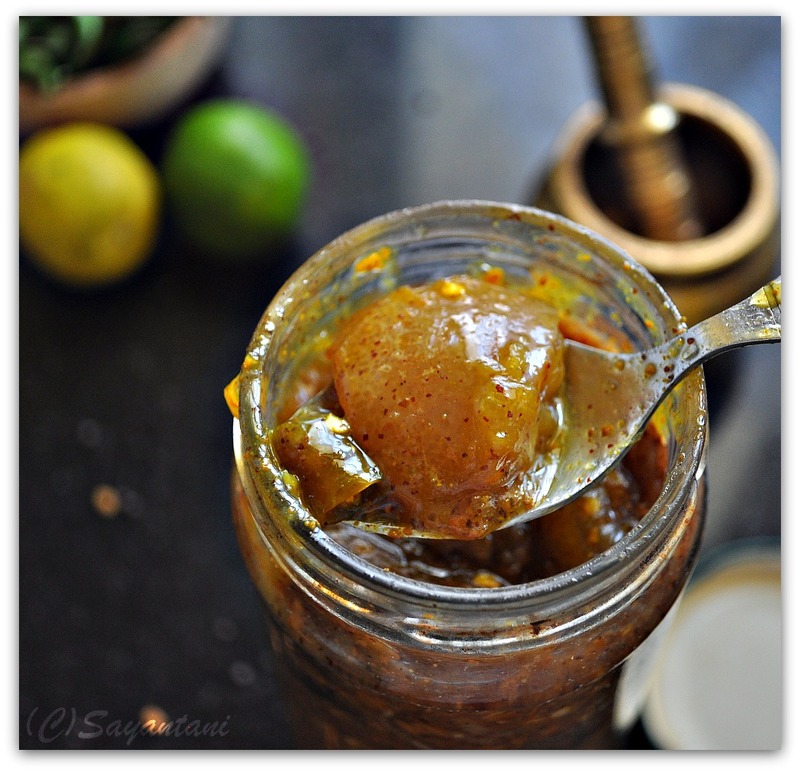 This lemon pickle belongs to Manisha of Indian food Rocks. And there was a time when almost all food bloggers made this pickles and blogged about it. Yes its that popular. But I strongly believe Manisha will disown this version of mine. Blame it on my sweet loving Bengali genes or me but I added way much more sugar than the recipe called for. Sorry, but I like my pickles with sweet and sour taste. 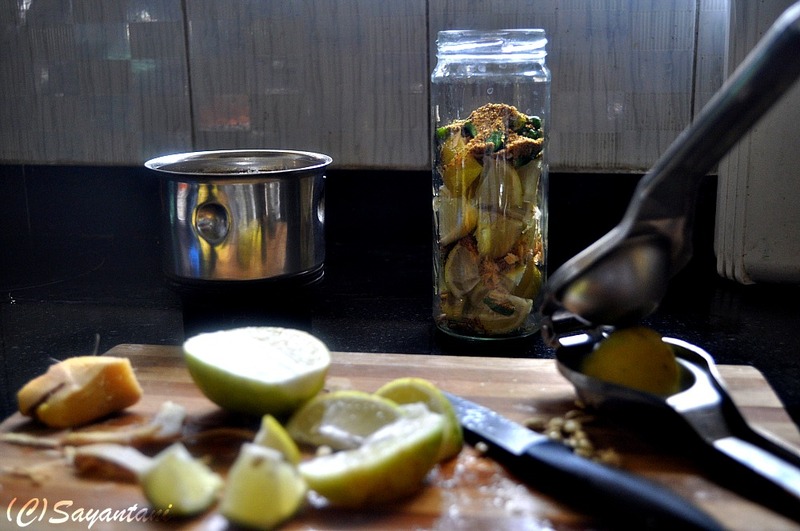 I have been making this pickle way before I started blogging and loved the fact that it does not call for any oil or any cooking. All you have to do is mix everything up and then place the jar in the sunniest corner of your home. I placed it on my kitchen windowsill and the notorious Kolkata sun cooked the pickle in a record 4 weeks time. My whole family is crazy about this pickle and every time they see good quality lemons they bring some for me to make this. I have made this pickle with both varieties; the bigger lemons with thick skin and small, thin skinned regular ones. The lemons you see in the picture are from my MIL’s backyard. She wanted a batch of this too and sent me a huge bagful. Manisha makes the pickle in summer (April) which I also did. But lemons are comparatively cheaper in winter months so am planning to make another batch very soon. If you want the original version shared by Manisha, please go here. For a sweeter and tangier version check mine below. *If unavailable please see the note below. Before you start the process make sure that the jar and the utensils are clean and dry. Wash all the lemons, chilies and ginger under running water. Pat them sry with a soft kitchen towel. There should not be any moisture. Reserve 2 lemons for juice. If you are using the bigger lemons cut them in half and then cut in 6 pieces. For smaller ones cut them in half and then in quarters. Remove the stem of the chilies and cut them in 2 or 3 pieces depending on the size. Peel the ginger and cut them in thin1” long juliennes. In a big dry glass or ceramic jar take all the cut vegetables. Add the fenugreek seeds, split fenugreek seeds, split mustard seeds, salt, sugar and turmeric powder. Mix and keep aside. Take all the spices for the spice mix in a small pan. Dry roast on very slow flame till they turn a couple of shades darker. Cool and grind them to a fine powder. Mix in to the vegetables. Squeeze in the juice of the 2 reserved lemons and give the jar a good shake to combine everything well. Place the jar out in direct sun to cook. I placed the whole jar on my kitchen windowsill which gets direct sunlight for 4-5 hours a day and mine was done within 4 weeks. After a day or two you will see lot of juice coming out of the lemons. Check the taste and adjust the sugar, salt or chili level according to your taste. Do remember to give the jar a good shake every day. Keep on stirring the whole thing once in every week. When the juice thickens almost to a coating consistency, check if the pickle is done by cutting one lemon piece. There should not be any white part in the skin, which takes maximum time to cook. It should be soft and juicy. Store in a dry and cool place and always take out with a dry spoon. To make your own split fenugreek and mustard seeds, roast the seeds on very low flame for a minute or so just to make it warm. Take them out in a mortar and using the pestle press the seeds couple of times. The skin of the seeds will break and you will get split seeds. 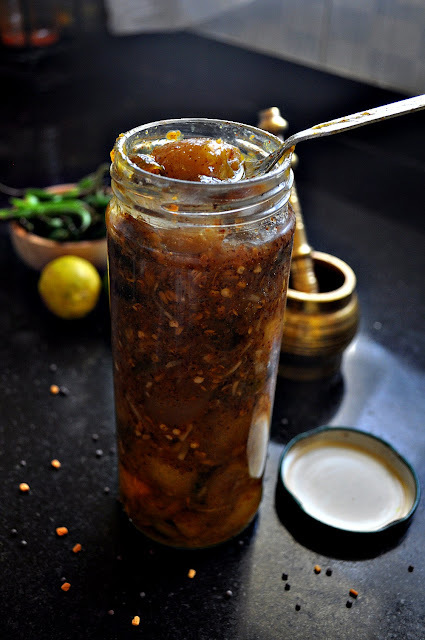 Pickle, Achar, achaar, lebu achar, nebu achaar, lebu lankar achar, nimbu ka achaar, nimbu ka meetha achar, sweet and sour leon pickle, lemon, lime, sharbati labu, sour lemon pickle, indian pickle recipe, sweet and spicy lemon preserve, lemon and chilli pickle, ginger in pickle, pickled ginger recipe, how to make indian sweet and sour pickle, no oil pickle, sun cook pickle, slow sun cooked lemon pickle, slow sun cooked method of pickle making, pickle without any oil, bengali style sweet lime pickle, marathi nimbu na locha, lanka achar, nimbu mirchi achaar, nimbu mirchi adarak ka achaar, side dish, lemon preserve, preserved spicy lemon and chilies, how to prepare indian preserves, mustard seeds, methis seeds, split methi. methi ke chawal, sarson ke chawal. I love this version Sayantani. It is very different from the one that we make but looks lip smacking and tickle my taste buds. Very tempting tangy pickel. i love it. Mouthwatering pickle... love the pictures. Bookmarking this... its just too good, will try soon. I guess there is a typo... its written 10tbsp salt... I'm guessing it is 1tbsp. 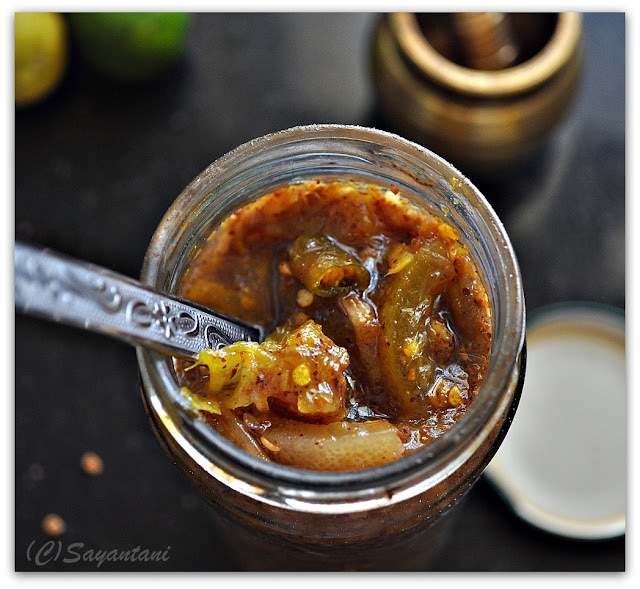 Slurp,mouthwatering here,can have this pickle with anything,simply irresistible..
thanks everybody for liking this. just give it a try and I can promise you would be hooked for life. @Anisha, thanks for your comment but this pickle needs that much salt. 10 tbsp is little more than half a cup. the salt actually cooks and softens the lemon skin. it also balances out the tartness of the lemon juice. Absolutely mind blowing shots my dear! lovely lemon pickle very tempting delicious and lip smacking.please leave some for me .I am coming over. This is my kind of lemon pickle..sweet and sour..really lip smacking..tangy and yum. I wonder how it taste the sweet and sour version. It is a citrus season here. Probably I can try with a sunny spot in my home. Like the picture! 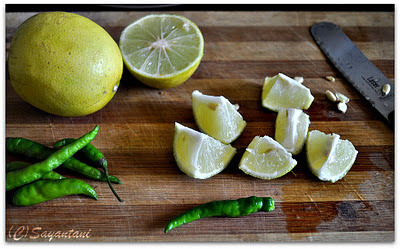 wow... lemon pickle without oil... looks so good... bookmarked.. I too prepare and have posted no oil pickles but adding sugar sounds interesting! Pickle looks lipsmaking good I am sure it would be a great accompaniment for any Indian meal. You are making me drool here. Since I discovered these pickles a a little over 3 years ago from Manisha's Blog (Indian Food Rocks), my home has never been without these spicy lemon pickles. Oooh, this looks great Sayantani. 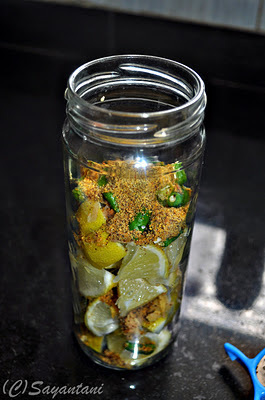 I absolutely LOVE lemon pickle, but usually too lazy to make it myself! Wish you could send some :). Hey Sayantani..missing home made pickle after reading your post.This pickle looks so....tak-tuk...parel some to me,please!! Pickle sounds yum , i'm bookmarking this one. 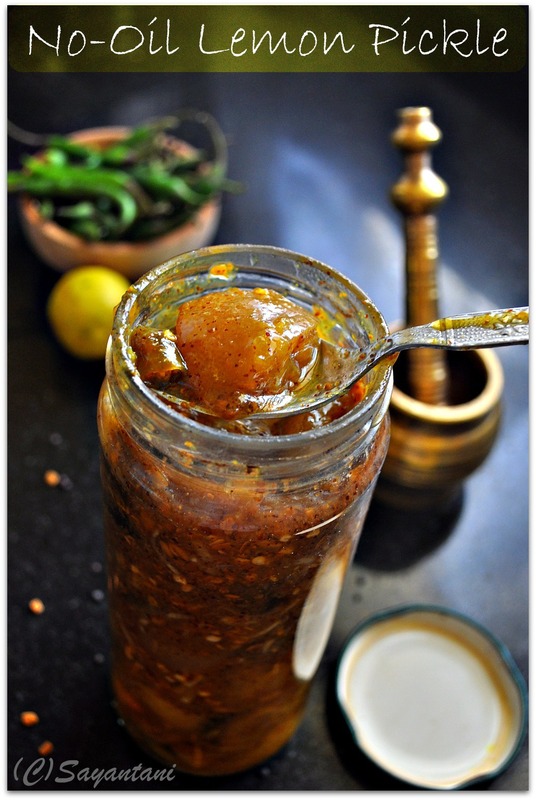 I am fond of lemon pickle and shall try your recipe. Looks yummy and mouth watering. Wonderful presentation. nice post. Now you can use this business 2 business directory to promote edible oils import & export business. Ho,the pickle looks superbly delicious.I loved your style.Happy meeting .. I like this sweet and sour lemon pickle.Lemon I get here is thick skinned not good for pickle. @swathi, dont worry thick skinned lemons are perfect for this pickle too. they simply would take longer time to get cooked. 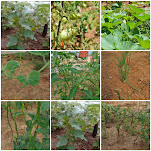 check out the link of Manisha's recipe given in my post. she made the pickles with limes. Hi there! Why would I disown your pickle? 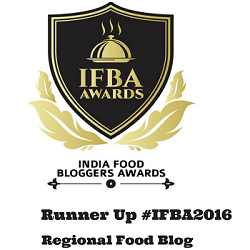 There have been as many variations as cooks and blogs :-D and yours adds one more to that tally! Make it your own, share it and enjoy it! I'm always happy when I see yet another variation. We do have a traditional sweet and sour lime pickle but that doesn't have mustard seeds as it is usually eaten on days when a fast is observed or at special religious meals. Thanks for giving my pickle a new twist! Tried this recipe and its absolutely lipsmacking delicious. After about 2 wks we couldn't wait any longer and started eating it. Perfect salt:sugar ratio. Wldn't change anything about it. Sbo, thanks and so glad that you liked it. Awesome recipe - thank you Chef!! Anisha - read properly, it says 10 tbsps for a reason - there is no type. @Anon, Thanks for your comment but I appreciate when people read the posts and points thoroughly and picks out the things that they think is not right. I once deleted the main ingredient while editing a recipe. its only the readers who pointed this out. So am glad that people noticed it and asked for a clarification. Hi, quick Q. I just cut up all the lemons and stuck them in the jar however I used half the sugar because I wanted you to clarify something for me first. 2) If I use the sugar as stated, is it going to be a very sweet pickle? I like pickles with a hint of sweetness. Do you think using just half the amount is ok or should I add the rest? @Ditz, The recipe I have given here is not very sweet but has a balance of sweet and sour tastes. If you are using garlic then you can half the amount of sugar as personally I believe garlic and sweetness do not go very well together. let the pickle sun cook for a few days, once the sugar is melted and absorbed you can do a taste test and can adjust the taste as per your chpice. 2) the stupid jar I bought that does not close and render teh bottle airtight. Now I am just sad. I bought new lemons and just followed the recipe with no garlic. I hope teh first batch cooks out ok - I won't throw it until it is cooked and dead! !